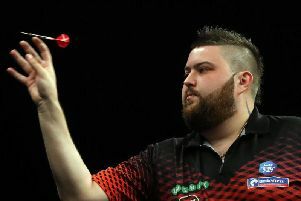 Michael Smith is anchored at the foot of the table following the latest results in the second phase of the Unibet Premier Darts League. The St Helens arrow smith, who reached the final of the competition last year, only picked up one point from a 7-7 draw with Peter Snakebite Wright last Thursday and then described his own performance as 'frustrating'. He said: "I needed two points to move me closer to the top four and I'm annoyed with myself, but I got a point and that's better than a defeat. Smith finished 108, 130 and an 11-darter in the early stages of the match in Ireland, but Wright claimed the first break in leg 11 to move 6-5 up with a 14-darter. 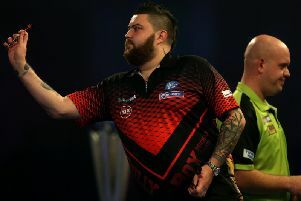 'Bully Boy' responded in the same manner to break back and then finished 85 on the bull to secure a point at 7-6, but Wright landed a 180 in the deciding leg before double four secured a draw. The local lad's task doesn't get any easier as he now faces defending champion Michael van Gerwen at the M&S Bank Arena in Liverpool on Thursday - a repeat of the January's World Championship Final.